At this point, we don't know much. But ESPN's Pat Forde has posted an article released this afternoon that alleges that the NCAA investigation is not over in Columbus. The gist of the article is that OSU's football program is still under investigation by the NCAA, and that a 2nd letter of allegations has been delivered to the school's administration. At this point, the existence of said letter is not known. But it is widely speculated that it does exist. The allegations in the 2nd letter would be in addition to the current known violations which forced OSU to self-impose sanctions which vacated 12 wins from 2010, and which led the resignation of head coach Jim Tressel. OSU meets with the NCAA this Friday to discover if their self-imposed sanctions will be sufficient punishment, or if the NCAA will add to them. From what it sounds like to me, there are allegations against Tressel, which we all know about. And there are allegations against the school, which we will likely find out about very soon. On July 14, the NCAA notified the school that it would not face a more serious "Failure to Monitor" charge at its Aug. 12 hearing, and that there would be no additional allegations beyond what the school was charged with last April. That news was greeted with exultation from Ohio State fans who believed that the worst of the investigation by NCAA Enforcement was over. But that could prove to be a premature response. The NCAA's enforcement department is still at work. There have been multiple media reports that came out after the school received its notice of allegations on April 25. 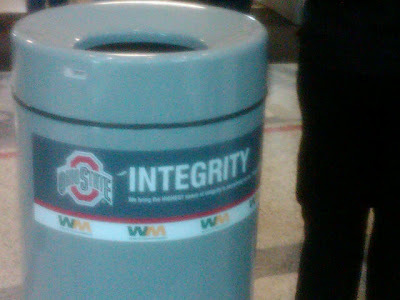 That notice alleged that then-Buckeyes coach Jim Tressel committed ethical misconduct, among other charges. Those media reports could be the subject of the ongoing enforcement investigation. If any of them are verified by NCAA investigators, they could result in additional major allegations against the school. Remember: You can't spell "investigate" without "vest".